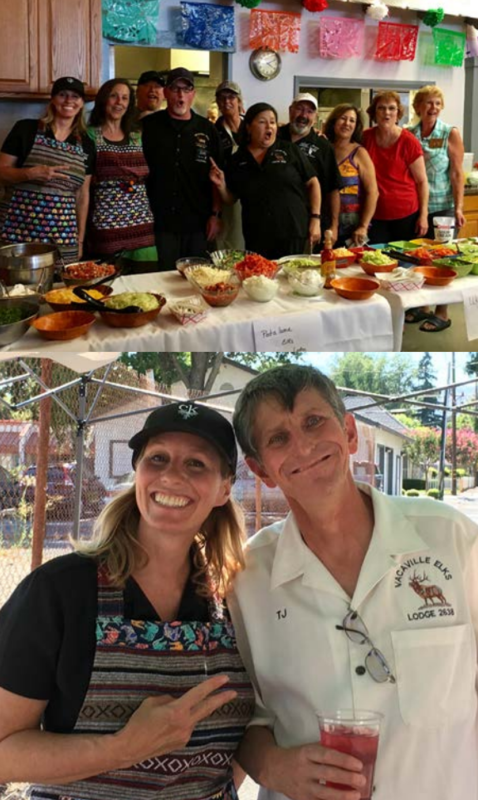 The result of our 1st Annual Taco Throw-down is in and, as projected, the Five Ladies of Vacaville Elks Lodge took first place with their fabulous tacos and salsa. San Rafael is proud to have placed second. However, the day’s feast was all around delicious and – and the true winners were our Veterans. The tacos were killer! And you haven’t missed out – if you take a small road trip, you too can indulge in these Tacos on Tuesdays. Just drop in at the Lodges of Petaluma for Deb’s over-the-top chicken tacos, Ukiah for Hal’s true street tacos & excellent salsa, or Vacaville for their ultimate winning tacos! Melanie Lamoureux and friend Mark (both of whom came back after their movie and prepped until after 1:30 am!). A special thanks to Kathleen Harrison for serving and pitching our Lodge’s tacos! And an extra thank you to Mark Giosso who diligently mixed and served his special homemade margaritas. Finally, a call-out to our Throw-down hosts – the always-terrific ER Dolores and the members of Vacaville Lodge. Thank you for making our 1st Annual Taco Throw-down a success!